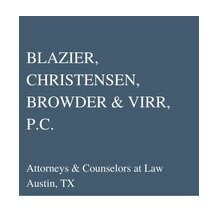 Since 1976, the law firm of Blazier, Christensen, Browder & Virr, P.C., Attorneys & Counselors at Law, has earned the respect of Austin area businesses coupled with a track record of success. Entering their fourth decade of service, the lawyers continue their commitment to protecting the business interests of company owners, both new and existing. The founders of our law firm are also entrepreneurs in their own right, sharing the successes, challenges and ongoing concerns common among Austin-based business owners. As lawyers, they understand that legal advocacy must be immediate to get control of a business problem or dispute. Representation must be immediate. Resolutions must be fast and effective. Lawsuits only disrupt operations and distract those responsible for the operations. While company owners do what they do best, our lawyers get to work and attend to all aspects of their business-related dispute. We want to secure the best outcome in an efficient and effective way. Complex litigation can threaten not only the reputation of a business, but also its future. Far too much is at stake to allow a lesser-experienced lawyer arbitrate or litigate a dispute. Each business case is treated personally and individually. Each business client comes to us with different needs and goals. Regardless of the complexity of the case, we will seek the best result that will allow you and your associates to continue your business operations.